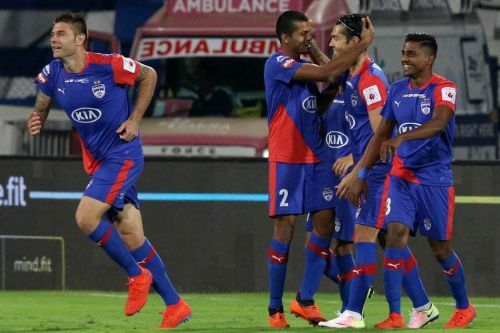 Bengaluru FC recovered well from a recent slump to complete a comprehensive 3-0 victory over FC Goa at Kanteerava Stadium in the Hero Indian Super League. Even though they will not be touching the 40-point mark like the previous campaign, the Blues have secured their first spot in the league for the second season running. Both the teams had fair chances in the first half, but they failed to accept the invitation. Nishu Kumar received two yellow cards within 40 minutes to divert the pressure on the hosts who had to play the remainder of the game with ten men. His absence did not affect the Blues who looked in supreme confidence as they were on the front foot for the rest of the game. During a set piece situation, FC Goa defenders were ball watching rather than marking Bengaluru's number 5 Juanan. The defender took utmost advantage of the situation and scored a volley from close range to give the lead to the hosts. Udanta Singh ran behind the FC Goa defenders to bag his fifth goal in this season and double the lead for Carles Cuadrat's men. The third goal was tallied when Miku launched a piledriver from outside the box leaving no chance for FC Goa to get back into the game. In this article, we shall look at five talking points from Bengaluru's victory over FC Goa. When Nishu Kumar was on the pitch, Bengaluru were not moving the ball quickly and created very few chances for their talisman Miku up front. Carles Cuadrat's half time talk came into devastating effect when the hosts were first rate in every department during the second part of the game. FC Goa looked vulnerable from set pieces and they were simply undone by Juanan's responsiveness to tap the ball in. The visitors' defence got caught when Udanta Singh made a long bursting run to beat the goalkeeper in a one-v-one situation. Not many goalkeepers would have saved that extraordinary shot from Miku which erased the hopes of an FC Goa comeback. The midfielders won many duels and showed hunger in the defensive and offensive part of the game only after Nishu was sent off in the first half. His dismissal was a blessing in disguise for the Blues as they stepped onto another gear.